For the Pulled Pork: Line a baking sheet with foil, place a roasting rack on top and line roasting rack with parchment paper and set aside. In a small bowl add the coriander, cumin, garlic powder, salt and pepper, and whisk to combine. Rub spice blend all over pork, transfer to roasting rack skin-side up, and refrigerate overnight. Preheat oven to 225ºF. Remove pork from refrigerator 30 minutes prior to cooking. Transfer pork to oven and cook until meat is tender and the fat and skin layer on top is soft and has an internal temperature of 170ºF, about 5-6 hours. Remove from oven and shred meat using forks. Set aside. For the Grilled Chicken: Preheat a grill or grill pan to medium high heat. Brush chicken on both sides with olive oil and season with salt and pepper. Place on grill, and cook for 5-6 minutes without moving. Flip and continue cooking until cooked through, about 5 minutes. Remove from grill and allow to rest for 5 minutes. Thinly slice chicken and set aside. For the Chorizo: Heat a medium saute pan over medium heat with olive oil. Add chorizo and cook breaking apart with a wooden spoon. Brown evenly, about 8 to 10 minutes. For the Pickled Red Onions: In a heat-safe glass jar, pack onions as tightly as possible and set aside. In a medium saucepan over medium heat, add white wine vinegar, rice wine vinegar, water, salt and sugar. Whisk to combine, bring to a boil and reduce to a simmer. Cook, whisking occasionally, until sugar has dissolved, about 2-3 minutes. Remove from heat and allow to cool slightly, about 2-3 minutes. Pour liquid over red onions and allow to come to room temperature, uncovered. Once cooled, cover and refrigerate. For the Spanish Rice: Heat a small dutch oven or heavy-bottomed saucepan over medium heat with olive oil. Add the onions and cook until soft, about 3 minutes. Add the garlic and cook until fragrant, about 1 more minute. Add the rice and stir together to combine. Add the tomato sauce, water, cumin, chili powder, and season with salt and pepper. Bring to a boil, then reduce to simmer. Cover and cook until tender, about 20-25 minutes. Fluff with a fork. For the Bell Peppers: Heat a large cast-iron skillet over medium heat with olive oil. Add the bell peppers, season with salt and pepper, and cook while stirring occasionally until softened, about 5-10 minutes. For the Potatoes: In a large pot add vinegar, potatoes and water to cover and bring to a boil. Reduce to low and cook until just fork tender, about 20-24 minutes. Drain potatoes and pat dry. Heat a large cast iron skillet over medium-high heat with oil. Add the potatoes, season with salt and pepper and cook until golden brown and crunchy on all sides, about 8-10 minutes. Remove to a paper towel-lined plate sprinkle with sea salt and Mexican chipotle chile. For the Guacamole: In a medium mixing bowl, add the avocado and mash with a fork but still keeping it chunky. Add the onion, jalapeno, lime juice, cilantro, and salt and pepper, and stir to combine. Set aside. For the Tortillas: Preheat a grill or grill pan over medium-high heat. 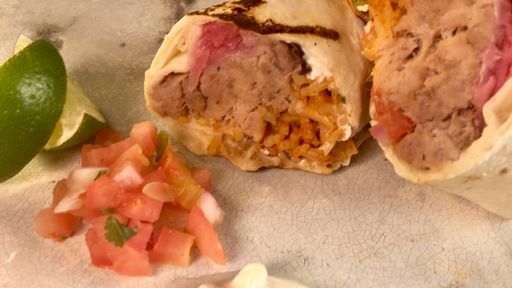 Wrap a brick in foil (or use a cast-iron skillet to weigh burrito down on the grill) and set aside. Build the tortillas by laying one tortilla in the center of a square of foil. Pick and choose burrito toppings: pulled pork, grilled chicken, chorizo, pickled red onions, spanish rice, bell peppers, potato cubes, guacamole, black beans, pickled jalapenos, and queso fresco down the middle of the burrito leaving about 1-inch space away from the edge of the tortilla. Wrap up the burrito, place on the grill, and lay brick on top of burrito. Cook until warmed through, about 5 minutes. Remove from grill and when cool enough to handle, serve with hot sauce, lime wedges, pico de gallo, and sour cream. Tip: Customize this recipe to your liking! Make as little or as many fillings as you’d like!